Limburger Cheese is also know as the "STINKY CHEESE". Originating from Germany, this cheese has a semi soft texture and is made from cow's milk. Price is sold per 8 ounce foil wrapped chunk. Weight is per half pound (8oz.). Limburger cheese is a soft, surface ripened cheese. Limburger cheese is world renowned for being one of the most pungent cheeses in existence. Although there were 100s of Wisconsin cheese plants making Limburger cheese just 50 years ago, Chalet Cheese in Monroe, Wisconsin operates the last Limburger cheese plant in the United States. 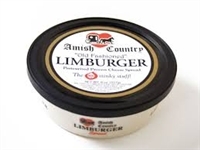 Though Limburger cheese is definitely categorized among those foods that are an "acquired taste," Limburger cheese has legions of fans. Price is sold per 8oz container. Brick cheese is a cheese from Wisconsin made in brick-shaped form. The color ranges from pale yellow to white, and the cheese has a sweet and mild flavor when young, and matures into a strong ripe cheese with age. It is medium-soft, crumbles easily and is somewhat sticky to the knife. Price is sold per pound. Beer cheese is a type of cow's milk cheese that originated in Germany, but is now known worldwide. Also produced in the U.S. mostly in Wisconsin, it is a pungent and salted surface-ripened cheese that starts out much like brick cheese. It ripens for seven months in highly humid conditions and is related to Limberg cheese, and has a similarly powerful smell, but paradoxically mild taste. Price is sold per pound.